Some of my readers may already know that I work for a costume/fashion jewelry company; one of the great parts of my job is the time I get to spend looking for inspiration and trends, where I often stumble across inspiring new sites, blogs, products and artists...one of my favorite finds to date is the jewelry of Michelle Chang, a former designer and artist who found her true calling in creating unique, beautiful fine jewelry (you can view her wonderful illustration portfolio here). Her favorite piece of mine is her elephant design, as they're my favorite animal! Unfortunately I haven't been able to squeeze buying anything into my budget yet, but the number of times I visit her Etsy shop every month tells me it's going to happen. 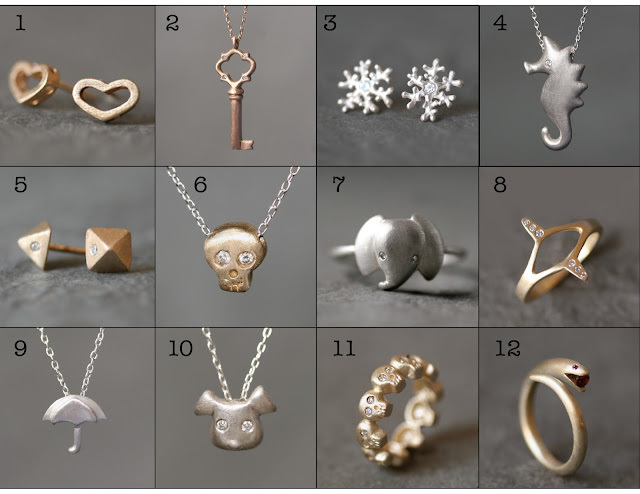 Check out some more of my favorites, like the tiny skulls and the little umbrella that reminds me of home, currently in her shop below. OHMYGOD. That elephant ring is too adorable! They're my favorite animal so I'm always such a sucker for anything with their design. They're mine as well! I have a lot of various elephant things, but not much jewelry. I think this ring needs to be my elephant staple! Jewelry is a kind of individual embellishment such as brooches, rings, necklaces, earrings, bracelets and anklets. Many of you must be wishing to look different and yet look stylish. Tapestry Wall Hangings have experienced a rebirth in the 21st century, as many homeowners are looking at them as a stunning alternative to traditional wall decor options. Nice jewelry here, thanks for sharing this. Fashion and jewelry blogs are always so exciting. I'll share this with our clients on strip bar Barcelona our social media community is quite big and they adore fashion. Keep up the good work and posting. By the way nice pictures, good shots. Designer Clothes I would like to say that this blog really convinced me to do it! Thanks, very good post. Women's fashion blog I have to search sites with relevant information on given topic and provide them to teacher our opinion and the article.